The purpose of this article is to describe what are the differences between resource planning in SAP manufacturing and SAP IS-Retail. These two types of systems have completely different purposed from business point of view. In SAP manufacturing leading process is either production in case of Make-to-Stock production or sales with Make-to-Order approach. In first case Sales and Operation planning (SOP) drives demand of goods and in second case Sales orders are the factor that starts internal production or external procurement of goods. In case of retail industry where most of the business is conducted in stores, main purpose of resource planning is to replenish sufficient goods to covers target sales. Of course both types of systems have common planning type like reorder point or forecasting but as indicated before there are differences that even start with naming. SAP manufacturing goods planning is called Material resource planning (MRP) in SAP Retail it’s called replenishment planning (RP). Time-Phased Planning was already introduced in ECC. Idea is very useful if planning and ordering always occurs on specific date (this can be for example always on Tuesday or second Wednesday of month) or defined time intervals. Planning cycle calendar is created in customization and assigned to material at logistic view of site. As forecast is mandatory for this type of replenishment, requested quantity is equal to forecasted quantity till next planning plus replenishment lead time. 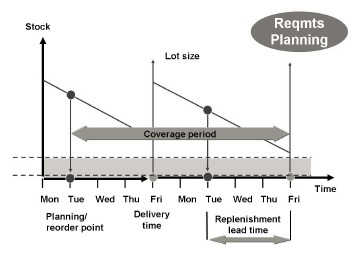 Requirements planning with time-phased planning. Source SAP. 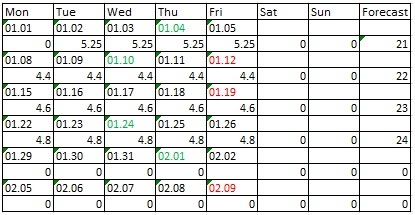 Planning days with average daily consumption for January and February marked on green. Now if I run planning with MD03 on 04/01 requested quantity is 29 and contain daily consumption till next planning (10/01) plus replenishment time of next planning (planning on 10/01 + 1 day of delivery time). Now if I run planning with MD03 on 10/01 requested quantity is 56 and contain daily consumption till next planning (24/01) plus replenishment time of next planning (planning on 24/01 + 1 day of delivery time). What new functionality has been introduced in IS-Retail is planned delivery cycle. It works quite similar to planning on specific day as described above, but delivery is planned on specific day. Delivery calendar needs to be created just like planning calendar. Then it’s assigned to material on site logistic view. In my case delivery dates are 2nd and 3rd Fridays and marked on red. 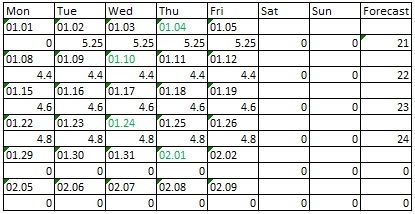 ZC1 calendar with on green planning cycle days. ZC2 calendar with on red planned delivery days. Now if I run planning with MD03 on 04/01 requested quantity is 33 and contain daily consumption till next planning (10/01) and it’s delivery date. Delivery date is 12/01. Now if I run planning with MD03 on 10/01 requested quantity is 61 and contain daily consumption till next planning (24/01) and it’s delivery date. Delivery date is 12/01. Delivery date comes in next available date from planning date plus replenishment lead time (in our case 1 day, which comes from planned delivery time set in material).